Thank you for visiting our BLOG where we post information about The Reel Interest, our Crew and our adventures. During the offshore fishing season in Charleston we will be posting trip reports and photos of our charters. We hope that you will enjoy reading our posts, and that you will join us aboard The Reel Interest for a deep sea fishing trip. This is a great recipe for a light dinner! I made this from Black Fin Tuna which I think is just as tasty as Yellow Fin. coat the tuna fillets with olive oil and sprinkle with salt, crushed black pepper and toasted sesame seeds. Prepare a hot skillet (I love my Cast Iron!) and sear each side for about 2 minutes for rare/medium rare. Let it sit for a couple of minutes and slice thinly. For the salad whisk together the olive oil, soy sauce, rice wine vingar, pepper flakes and scallions. Apply to the salad, add tuna slices and enjoy. The Bull Dolphin or Mahi-Mahi is a beautiful fish found in the waters of the Caribbean and the Americas coast line. The Bull Dolphin (Caryphaena hippurus), Dorado or Mahi-Mahi, as it’s also called, is the male of the species and has a blunt square head. Often referred to as “Dorado” for its beautiful gold, green and blue colorations, it is one of the ocean’s most beautifully colored fish and should not be confused with its smaller relative the Chicken Dolphin. The Mahi-Mahi have compressed bodies with long dorsal fins. They are distinguished because of their range of beautiful colors: golden to blue to greens. The Bull dolphin is the larger of the dolphin species. They seldom exceed 90 lbs. Their natural habitat is offshore and rarely do they come near shore. They are considered surface feeders exclusively around 0 – 70- ft. of water. They reach sexual maturity during their first year, typically by 5 months of age. The female Mahi-Mahi spawns 2 – 3 times per year and produce over 80,000 eggs. Their larvae can be found year-round in warm waters with a greater number in the spring and fall. Bull dolphin is commonly caught around grass rips (long stretches of sargassum weed) where it feeds on shrimp and smaller fish. We find dolphin in depths of 70 feet into 1,800 feet of water off the coast of Charleston. This dolphin is known for its spectacular frenzied leaps when hooked. White Marlin are generally found off the east coast of the U.S., Mexico and the Caribbean. Smaller than other species of Marlin it is a very strong fighter. It is lighter in color and has a body that is dark blue to brown, and a white underbelly with spots on the dorsal fin. The average size of a White Marlin is about 50 inches, but some catches have been reported with lengths of over 8ft. They typically roam in deeper waters alone or in small groups. Last week an evil-looking fanged fish washed ashore on Jennette's Pier in Nags Head, North Carolina , leaving visitors of the pier shocked, according to the Daily Mail. The gigantic fish, which was still alive when it washed ashore, was determined to be a long-snouted lancetfish (Alepisaurus ferox) commonly known as handsaw fish. The fish can grow up to 6.6 feet in length and are known for having a tall dorsal fin and large fangs. They are also cannibalistic in nature, according to the Daily Mail. "Lancetfish - Check out these images of what we believe is a lancetfish. It was photographed Monday night, just south of the pier. They rarely come close to shore as they're an open ocean or pelagic fish. Have you ever seen or heard of them?" Jennette's Pier wrote on their Facebook page. Famous for being an ambush predator, lancetfish are not considered fit for human consumption, and they often wind up being used as bait. Lancetfish can be found in open water in subtropical and tropical locations. They have been spotted before in places like Iceland and Greeland however, according to the Daily Mail. Photos of the fish have gone viral since lancetfish are rarely scene or caught. The lancetfish was released back into the water after a few photos were taken. Officials believe that the fish washed ashore because it was sick. Biologists have yet to figure out the life cycle of the lancetfish yet that usually inhabit the open ocean. The first leg of the Inshore Fishing Association’s (IFA) was hosted by the St. John’s Yacht Harbor on John’s Island in Charleston, SC. Thirty-five kayak anglers from North Carolina, South Carolina, Georgia, and Florida tested their skills - and maybe some luck - in the search for a redfish and speckled trout to win this Atlantic Division leg of the IFA Kayak Fishing Tour. This event marks my third year participating in the IFA events. In my opinion, being a local and fishing this event really does not mean too much. For me, kayak fishing is all about exploring new areas to test my fishing skills and further my knowledge of areas that hold fish. Some of my searches result in long distance paddling in either my Jackson Kayak “Cuda 14” or the “Big Tuna”. The big challenge for this event is that the competitors will be starting at low tide. I opted for the Big Tuna for this tournament. My main reason for selecting the Big Tuna over the Cuda is the stability and the blaze orange color of the Big Tuna. This would be very important because my plan was to fish several areas on the Charleston Harbor, Wando River, the Cooper River, and several small creeks that flow into this area. The color choice is mainly to make me visible to the hundreds of boaters cruising the harbor. I have had many boaters inform me that they have no problem seeing that orange-colored kayak from the distance. The other reason that I selected the Big Tuna is the openness of the deck in from of me when the kayak is configured in the solo seat positioning. Launching from Remley’s Point at safe light (6:15am), I paddled across the Wando River towards Daniel’s Island to see if I could locate some trout or redfish. I started out with a topwater lure for the early morning trout bite. Having no luck around the point of Daniel’s Island, I paddled across the harbor section where the Wando and Cooper River come together to Drum Island. Across this section of water I had a small pod of dolphins join me. It was like I was part of the pod; I had some of them about 3’ on my starboard side and a few on the port side about the same distance. We parted ways when I glided into shallower water. I fished around the north end of Drum Island with no luck, so I decided to paddle across the Cooper River to a little flat, and then check out a couple of small creeks behind the Coal Chutes. Working my way across the small flat, I eventually made it to a small creek that flows to Magnolia Cemetery. In the past, this small creek has produced some nice trout and redfish. By this time the tide was starting to come in. I did not find any fish on my way to the cemetery. On the return trip, there was a dolphin searching for a snack heading in the direction I came from. Exiting the creek, I paddled to another small creek that is somewhat dry at low tide but has a few pockets of deep water that would be my next section to test the Big Tuna. I entered the creek, lifted the rudder, and let the incoming tide carry me along the winding creek as I stood, searching for some redfish. As I was drifting along, I heard a commotion from behind. Suddenly four dolphins swam past me - even hitting the Big Tuna. I managed to stay standing from this test of stability, but I had to sit down right away to get my heart to slow down. At this point, I decided it was not worth the trip up that creek into the grass. All I could think about was the feast of redfish those dolphins were enjoying. I decided to work my way along the west shoreline toward Seabreeze Marina. I paddled across to Drum Island to fish the Charleston side of the island. After fishing along the shoreline of Drum Island and ending up at the area that I fished earlier in the morning, I crossed the Cooper River back to Daniel’s Island. When I arrived at the rock rip rap of Daniel’s Island, I finally started to get hits on the D.O.A. “CAL Shad” in the Golden Bream color. The hits were small bluefish taking the tail off, so I kept replacing the lure. I had a solid hit that was not the bluefish tap. I set the hook lightly, hoping for a speckled trout. The short battle resulted in several head shakes and then a fat trout appeared. 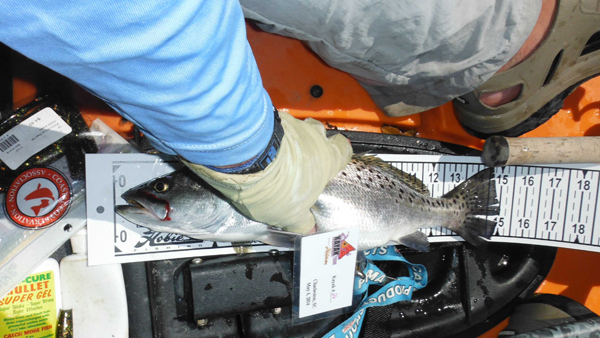 I landed the fish, placed it on the 321 measuring board, and snapped a photo of a 14.75 inch trout before the release. It was 11:30am, so I thought all I needed to do in the next hour or so is to locate some redfish so I would have a chance at bringing in an “IFA Slam” for scoring. As I worked along the shoreline, I managed to hook up a few more trout that appeared bigger than the speck I had measured and photographed. Unfortunately, they would throw the hook next to the kayak. I decided to cross the Wando River and try some docks along the far side as I made my way back to the landing to load up. I must have fished nearly a dozen dock systems, and arrived to the landing at 2pm with no redfish for the IFA Slam. At least I did not get skunked, and would be on the board someplace. 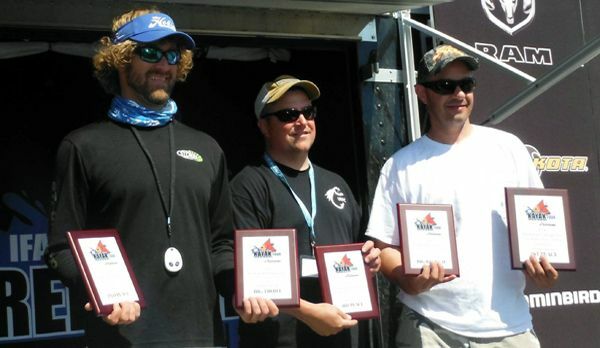 When all the results were reviewed, the top three places were: Dave Jaskiewicz with an aggregate score of 47.44”, Justin Carter with 47.25”, and Brad Knight with 44.5”. Dave Jaskiewics had the biggest redfish at 31.38”,and Justin Carter landed the biggest speckled trout at 20.5”. The latest changes the IFA made to the tournament -defining the region boundaries - appeared to have leveled the fishing area for all participants. Congratulations to the winners. I managed to place seventeenth in the field. The final leg of the Atlantic Division will be in Georgetown, SC on August 17, 2014. For more information on the IFA Kayak Tour, check out http://www.ifatours.com/kayak-tour/kayak-schedule/. In my years as a Captain and professional fishing guide, I have filleted thousands of fish. I have never come across a knife that fillets fish so effortlessly as the Bubba Blade. It is by far the finest handling, most comfortable, and best gripping fillet knife I have ever used. The Bubba Blade allows you to apply maximum strength with minimum pressure and fatigue on your joints and muscles allowing you to cut through even the thickest scaled fish. This knife holds up great against the harsh day in and day out saltwater conditions and makes the job of filleting and skinning my catch a breeze. It truly is the ULTIMATE Knife! You asked for it and now it's here! The 7 inch flex blade . We use the same patented textured no slip grip handle, and stainless steel as the other Bubba Blades . The non-stick coated 7 Inch blade makes filleting smaller pan fish & meat cutting even easier. Add this 7 inch blade to the 9 inch flex & 9 inch stiffe and have the perfect filleting & carving set of knives. 7" Blade with 6" handle for a total length of 13"
In the dead of winter, North Carolina's Hatteras Village is quiet. The king mackerel run has ended, and the spring yellowfin tuna run is a long way off. Charter boats rest at the dock while local anglers turn their attention to other pursuits. But last winter, several area skippers, experimenting with vertical jigging, discovered big blackfin tuna on the rock piles and wrecks off Diamond Shoals. Word spread quickly, and what started out as a trickle of boats running out Hatteras Inlet turned into a deluge of anglers descending on the island to get in on the action. Almost overnight, the docks were bustling; tackle shops were selling out of jigging gear, and the charter fleet was called into duty. Blackfin tuna had brought life back to Hatteras Village. As soon as reports of the blackfin bite started leaking off the island, I was quick to investigate. Most of the reports emanated from the local charter boat Big Tahuna. From the rumors, it seemed that Capt. Scott Warren was at the center of this emerging fishery. To get to the bottom of the story, I called Warren and made arrangements to tag along on a blackfin trip. The morning I arrived at Teach's Lair Marina, a thin layer of frost sparkled on the grass, and a handful of men dressed in heavy coveralls shuffled around the marina breathing thick vapor into steaming cups of coffee. The scene didn't look like a typical prologue to a tuna trip, but Warren gathered us in the cabin of his 54-foot Carolina-built charter boat and dispelled our doubts with reports of excellent action the day before. "We caught tuna up to 30 pounds yesterday," he told us, "and we stopped keeping fish after we had 24." I felt warmer already. After the pep talk, Warren fired up the Big Tahuna, and mate Kenny Koci carried a quiver of short jigging rods with oversized reels packed with rainbow-color braided line out of the cabin. After all of the rumors and boasting, I couldn't wait to get a taste of the action. The run to the fishing ground was short, and by the time the rods were ready, Warren pulled back the throttles and started a search for signs of blackfin patterns with his fish finder. Warren called me up on the bridge, and one look at the fish finder told the story. The screen was covered with fish marks, but Warren explained that the cloud of red and green covering half the screen was most likely a school of false albacore or amberjack. "When I started doing this, the first thing I had to figure out was what blackfin look like on the fish finder," he explained. 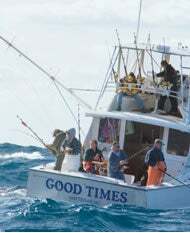 In fact, he said, the hardest part of catching blackfin was keeping jacks and albies from beating the tuna to the jig. If you've been fishing for any length of time, you undoubtedly have met someone along the way who has been the unfortunate victim of skin cancer. While most cases are benign and do not generally metastasize, the threat of deadly melanoma is an ever-present reality to saltwater fly-fishermen. Those who spend extended periods of time under an intense sun are more vulnerable to this potentially fatal disease, and for years anglers have paid careful attention to sun-protection factor (SPF) ratings associated with sunscreen products commonly applied before and during a day of fishing. But increasingly, as apparel manufacturers develop ever more advanced products, anglers are wising up to the fact that the very clothes they wear can also play a dramatic role when it comes to protecting their bodies. To be sure, anglers should always apply liberal amounts of sunscreen to bare skin that comes in direct contact with the sun — the higher the SPF rating, the better. But they should pay equal attention to ultraviolet-protection factor (UPF) ratings associated with their clothing. Developed by Australian researchers in 1996, UPF ratings define the amount of ultraviolet light that penetrates a fabric. A UPF rating of 30 indicates that one-thirtieth of the ultraviolet light hitting the fabric actually penetrates it. "It's so important," says Jaelithe Milich, marketing communications specialist at ExOfficio, a Tukwila, Washington-based apparel manufacturer. "A regular T-shirt has a UPF of about 7. You may not get sunburned through that T-shirt, but you'll get a lot of rays penetrating through it that could affect you in the long term — especially in a tropical environment." So what factors play a role in increasing a garment's UPF rating? Several things, most notably the composition of the yarns, the tightness of the weave or knit (a tighter weave improves the rating), color (darker colors are generally better) and stretch (more stretch lowers the rating). Additionally, fabrics often produce a lower rating when wet, and garments become less effective when timeworn or faded. "[But] tighter fabric weaves, heavier-weight fabrics and darker colors are not always the best way to achieve a high UPF rating," says Diane Bristol, director of marketing and brand management at Simms Fishing Products. 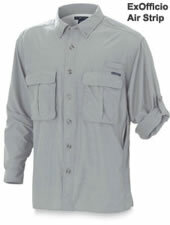 "The combination of a tighter weave, which is less breathable, heavier fabric and dark color would make this type of shirt uncomfortable for a hot-weather fishing environment." I clearly remember my first pair of polarized sunglasses. I was 16 and just getting into the sport. I had a 9-weight, two Lefty Kreh-style floppy hats (white and khaki) — even a couple Tarponwear shirts. But I hadn't yet bought a key piece of equipment that I really needed. Finally, I managed to stash away a few bucks and purchased a pair of Costa Del Mars in the old aviator style. For good measure, I also got some side plates and a chord to keep them safe around my neck. Watch out world — I was ready! Flipping back through my old fishing pictures from those days, I have to laugh — those glasses were ridiculously big on my slim face! But, boy, did they keep out the sun. Better yet, they opened up a world of underwater vision throughout the waterways of southeast Florida. Today, just like then, polarized sunglasses are of vital importance to fly anglers plying the salt. What's more, modern technology has made them even better. The first and foremost function of sunglasses is safety. It's easy to underestimate the power of the sun's ultraviolet rays, especially in tropical climates frequented by saltwater fly-fishermen. Factor in the ever-present glare off the water, and you have all the ingredients for serious eye damage. Most quality polarized sunglasses offer full protection from damaging UVA and UVB rays, but that's not what really gets fly-fishers jazzed about their shades. Instead, it's their polarizing qualities, which help anglers spot fish by reducing harsh glare and increasing visual acuity. "Sunglasses don't get as much attention as they should as far as being a key piece of equipment," says Peter Crow, general manager of Smith Fishing, a division of Smith Optics, one of the original sunglass brands that first catered to the fly-fishing market. "Everyone focuses on rods and reels. But you're really up a creek if you go to Christmas Island without a good pair of polarized glasses — or even a few pairs." Crow is right. The proper pair of glasses can make all the difference between a productive day and a poor one. When fishing the flats, lenses with brown or amber tints are generally more favorable. These lenses greatly enhance contrast, which makes underwater obstructions and bottom irregularities more visible. They also make an approaching fish stand out like a sore thumb, giving an angler and guide valuable time to deliver an effective presentation. Want to increase your catch? The quest to determine the best times to hunt and fish is not a recent project. For hundreds of years people that made their living hunting and fishing recognized that there were certain times when wildlife was more abundant. The lives of most Native Americans were completely dependent on knowing the best times to hunt and fish. People who base their existence on the ocean or lakes have long understood that solar and lunar influences help determine the best times to fish. What is generally known and almost universally accepted is that fish and game are more active at certain times of the day, most noticeably at dawn and dusk. It is also generally agreed that many game species are more active during certain phases of the moon as well as when the moon is in certain positions in the sky each day. All of these influences have an individual effect that can be observed and in some instances measured. Much of the early research and understanding of solar and lunar influences was pioneered by John Alden Knight. In 1926 Knight began his studies of various influences that affect wildlife activity. This research resulted in his publication of tables that illustrated periods in each day of major activity and minor activity. To substantiate his research and theory, Knight analyzed data for over 200 record catches of fish. His analysis concluded that 90% of the catches were made while in the effect of the new moon and while in a "solunar period". Additional proof of Knight's theory was provided by a biologist at Northwestern University. Dr Frank A. Brown had live oysters flown in to his lab in Chicago, Illinois. Oysters open their shells at each high tide. Dr. Brown wanted to see if this opening and closing was the actual result of the changes in water flow from the tides or from lunar influences. Dr. Brown discovered that after about a week the oysters had changed their opening and closing to correspond to the times that the moon was directly overhead and underfoot for Chicago. Solunar tables have been used in some form since 1936. Since that time, the most significant improvement in our understanding of influences on wildlife activity has come with more recent capabilities to calculate and observe the combined effect of multiple solar and lunar influences. The days and times of these combined influences result in periods of significantly increased activity, which are shown in Weather and Wildlife Charts.